2019 Adult Summer League Registration is now open! Check out our 'Adult Summer League' page to sign up! Have you checked out the BE Ultimate on-line store lately? TUC members are eligible for the league discounts of 15% off Sublimated Gear and 10% off Screen Printed Apparel. TUC Youth and Club Touring teams are discounted at rate of 20% for all Sublimated gear and 10% for all Screened apparel. Always wanted to play Ultimate? Want to become a TUC member? Our Volunteer of the Year for 2018 is Chelsea Jackson! Chelsea was extremely involved with the Club throughout the entire year. For starters, she was engaged with numerous Juniors programs as a coach from the start of the year. From there, Chelsea went above and beyond and took it a step further by joining the Board. Since then, TUC has seen her put in even more time and effort, being involved with several committees and being the chair of not one but two committees! 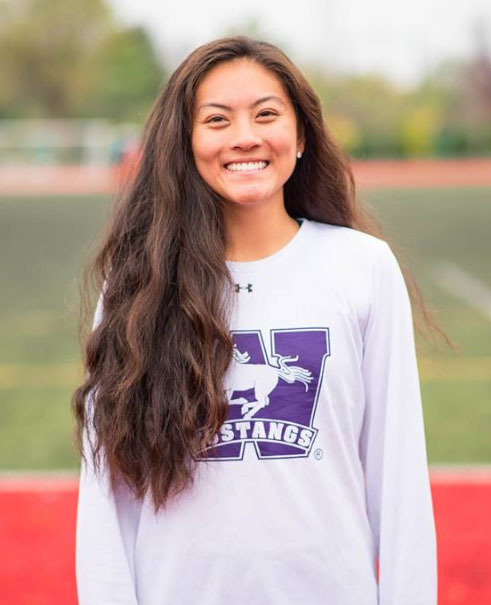 Not only that, but she still finds the time to volunteer even more of her time to Juniors coaching, as well as clinics and other opportunities that arise. On behalf of TUC, we are extremely grateful for the countless (quite literally) hours she has put in, and we really appreciate her dedication to TUC. If you see her, make sure to thank her for her hard work! Looking to play in one of TUC's leagues? Check out the list below to see what still has space! If you have any questions about Adult leagues, feel free to contact Nicolas Edwards (adults@tuc.org). For Juniors related inquiries, you can direct them to juniors@tuc.org. Remember: to register, participate, or sub in any of our leagues, you will need an active membership. You can view our annual and monthly membership options here. Please note that the list of remaining spaces below was last updated at 12:00pm on February 12. Looking to do more than just participate in adult leagues? TUC needs Juniors Coaches to help provide opportunities for young players getting to know the game, both for the first time and at a deeper level. Feel free to email juniors@tuc.org if you are interested, or if you have any questions. Sunday Co-ed Beach League @ Beach Blast - 1 team spot left! It is great to see the community engaging in an active and spirited discussion around the game they are passionate about. This pilot project was introduced as a result of a few factors. Two factors that stand out are safe play and the evolution of the game. The first factor, safe play, is the recognition that TUC saw a spike in on field injuries with the common element being players colliding and some of these instances being a direct result of a dangerous play as reported by the players. 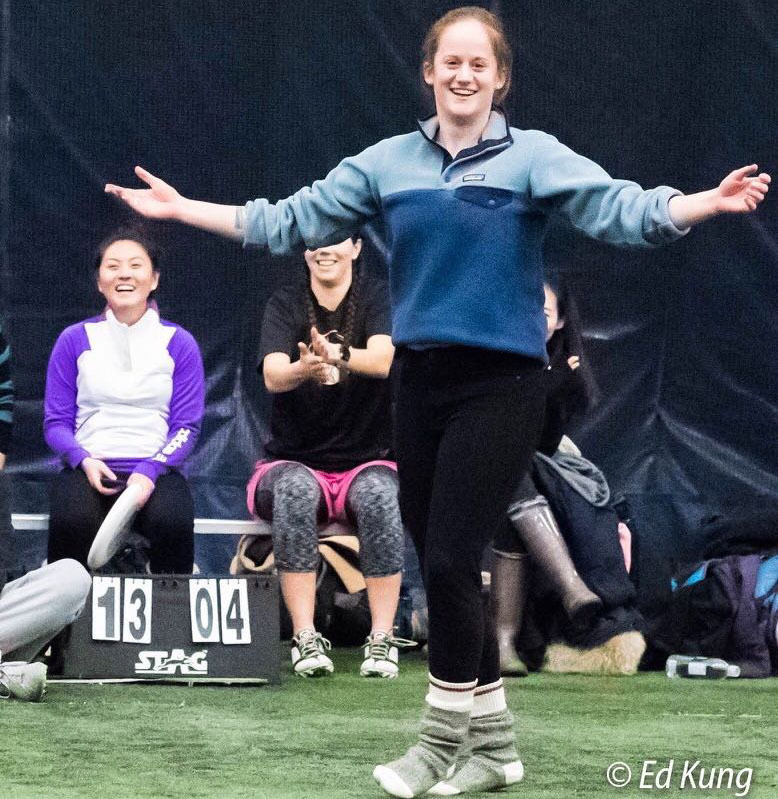 The second factor, evolution of the game, addresses the fact that the game of ultimate is changing as the sport becomes more popular with the introduction of semi-professional leagues. As new players with different sport backgrounds join the game, the strategies and plays evolve. This pilot project address these factors with the introduction of a proven rule used at the world’s level. We are excited for our two selected leagues participating in the pilot project to begin play under the new rule today and look forward to understanding how our community implements the change and understands the rule. We have prepared to record feedback multiple times throughout this project to document the change and decide what is best for the community as a whole. This process will help prepare the organization for the possibility of rolling out a rule change league wide that best suits our community. We would like to highlight that the rule book is in place to help guide play and it is not a tool to gain an advantage as this would be an abuse of the rules and contravene spirit. We thank everyone for their active feedback, both positive and constructive, that has already been received as this is an important element in the pilot project. TUC is happy to answer all questions and field all feedback related to this project by emailing adults@tuc.org. 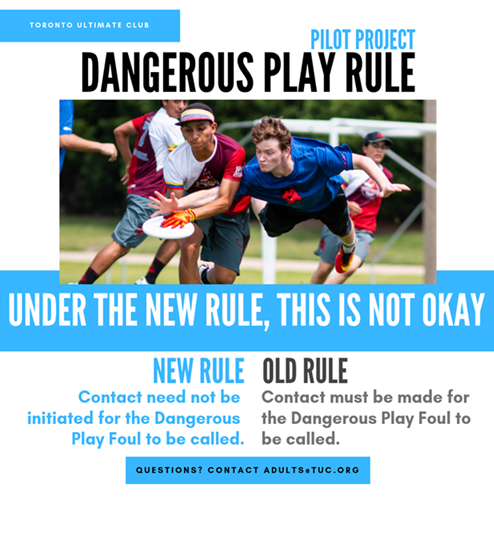 TUC will be implementing a pilot project (in the Thursday Downsview HAT league and the Thursday Monarch Elite league) where the WFDF Dangerous Play rule will replace the USAU Dangerous Play rule. The goal of this change is to provide a safe environment for all TUC players in all games. At the core level, Ultimate is a non-contact sport and this rule embodies this principle of the game. Know up front this change will not be a perfect solution to something that may have happened in one of your past games and it will take time for all players to make an adjustment. How you play the game and communicate with your fellow players is the best way to implement change in your community. As always, play with spirit. Reckless disregard for the safety of fellow players is considered dangerous play and is to be treated as a foul, regardless of whether or when contact occurs. This rule is not superseded by any other rule. If uncontested this must be treated as the most relevant foul. Dangerous Play fouls can be called before an event to avoid a potential collision e.g. a defender runs/layouts in a way that an accident would occur if the offence were to continue. When this occurs it is correct to not make a play on the disc & to call a 'dangerous play' foul. Players calling a Dangerous Play foul before a potential incident need to have reasonable grounds for doing so. They should actually be able to see the oncoming player and have some reason to believe that player will not avoid contact - this could include a previous history of that player to not avoid contact. You cannot call Dangerous Play if you feel you could have made a play on the disc, but that would have resulted in you initiating contact. In that instance, you should just refrain from making the play. Contact must be made for the Dangerous Play Foul to be called. Contact need not be initiated for the Dangerous Play Foul to be called. "Non incidental contact that occurs directly after the attempt at the disc (i.e. a defender catches the disc and then collides with an offence player) is considered to have occurred during the attempt at the disc." What is the outcome of a Dangerous Play Foul? Disc returns to the last uncontested throw. Stall count +1 Disc is awarded to the player making the call. How is TUC monitoring & following up? There will be multiple check in points to gauge this new rule change. Communication will be sent out to introduce the program and provide a contact for those requiring clarification of the rule. On a weekly basis, the captains will be asked if the new rule was used, the situation involved and the resulting outcome. This will help ensure the new rule is consistently enforced and gives the organization an opportunity to make any necessary changes to the rule going forward. At the halfway mark of the season, all players in the league will be contacted to gather their feedback of the rule change and how it has affected their play. Following the results, the Board will review the feedback and determine if the rule should be applied to all leagues as is, modified and applied to all leagues, or revert back to USAU Dangerous Play Rule for all leagues. For players participating in the pilot, please direct all questions and feedback to adults@tuc.org. Depending on the questions we receive, a community resource center may be created to assist with frequently asked questions. Stay up to date with all the TUC events this season. 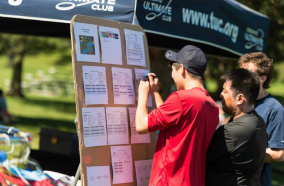 The Toronto Ultimate Club is the flagship organization that provides the highest quality Ultimate experience to the greater Toronto community. Its growth is measured by member value and is driven by integrity, excellence, and citizenship.